GoCre8’s Paul Lin (L) with Stanford Marsh’s Julian Mennell (R), alongside the new HP PageWide XL5000 printer. 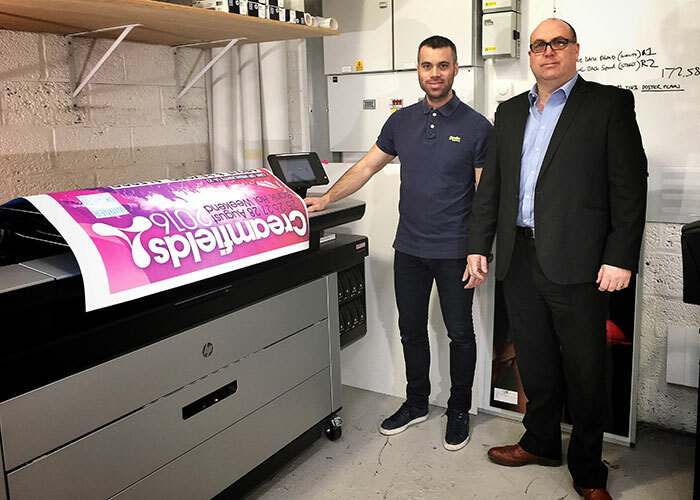 Stanford Marsh, one of only three UK vendors able to supply and service HP’s new PageWide XL Series of products, has installed the UK’s first HP PageWide XL5000 printer at Liverpool-based Go Cre8. Founded in 2003, Go Cre8 is a multidisciplinary design and print company that prides itself on providing professional services in design, print, display and new media at fair, affordable rates. Employing seven full-time staff, the company’s clients include small and medium sized businesses, local authorities, and agencies nationwide. Having initially heard about HP PageWide technology at the start of 2015, the company decided to visit Sign & Digital UK at Birmingham’s NEC last spring to find out more. At the show, Go Cre8’s Project Manager, Paul Lin met with Stanford Marsh’s Julian Mennell on the HP stand and discussed how the companies could work together. Paul Lin explains: “We wanted a fast, cost-effective poster printer and, from what we were reading, the HP PageWide XL technology seemed to fit the bill. We wanted to increase productivity, whilst also freeing up our Océ Arizona flatbed printer for more profitable work. In contrast, the HP PageWide XL 5000 Printer provides fast, powerful and efficient monochrome and colour prints in a single device with up to 30 percent savings in total production costs, thus providing companies such as Go Cre8 with the ability to cost-effectively produce posters at speeds of up to 14 AO size posters a minute. The printer was seamlessly installed at the company’s Liverpool base in December 2015, and since that time Go Cre8 has been using it to quickly and efficiently output POS posters to deliver a rapid turnaround on jobs. It offers a huge jump in productivity, leaving the Arizona free to print to other more bespoke substrates and applications. Stanford Marsh is working alongside Go Cre8 on an ongoing basis and is continually developing new materials for use in the HP PageWide XL 5000 Printer. Go Cre8 recently required a blue back product that Stanford Marsh was able to source and convert for use in the PageWide machine. For further information on SMG, visit: www.stanfordmarsh.co.uk. For further information on GoCre8, visit:www.gocre8.co.uk.